Had it not been for the fact that the mid-1960s ‘then’ photo above was labelled as ‘86 Warwick Road’, it would have been very difficult to identify the ‘now’ equivalent. In fact, only the tip the chimney of the neighboring Sagar’s carpet shop, poking above the roofline of the now demolished cottage, gives us any common reference point. 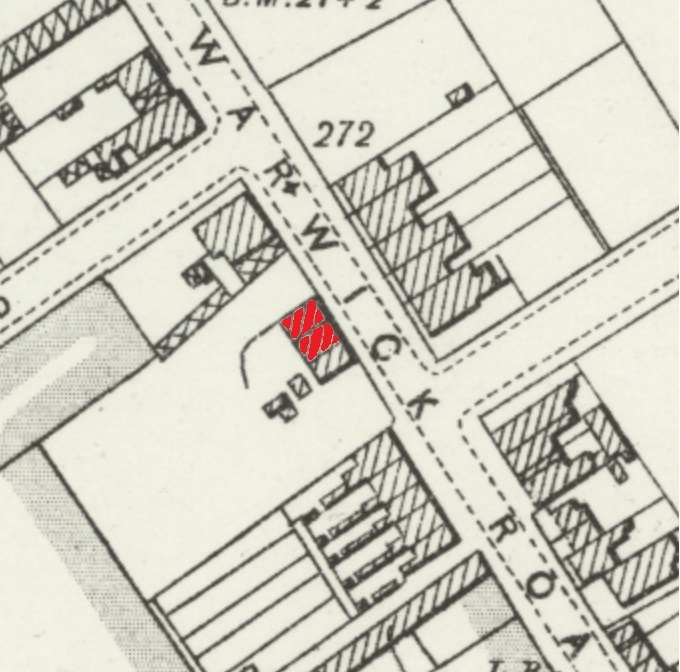 The cottages shown here once stood on Warwick Road between the Queens Road and Waverley Road junction and were once part of a row of three identical cottages. So, the demolished cottages in the photo can in fact be easily dated, thanks to the details in the listing for the remaining one. The remaining cottage was Grade II listed in 1971, just a handful of years after its neighbouring brethren were destroyed. The listing describes it as “Late C16 or early C17. Stone plinth, timber frame, red brick nogging, old tile roof. One storey and attic, 2 casements and small shop window, 4 gabled casement dormers. Glazing bars to all casements”. Quite how the remaining property managed to survive until the conservation era is a mystery and perhaps something to be thankful for. The two cottages that were demolished were subsequently replaced by 1960s flat-roofed commercial units. Within the KHAS archives there is an undated sale notice for “Lot 3 – A valuable and conveniently placed enclosure of Market Garden Land (formerly known as Warwick Road Allotment) containing an estimated area of 1a. 1r. 23p. (or thereabouts*) adjoining the rear of nos. 86 to 104 Warwick Road with good access from Warwick road between No. 104 and The Waverley Garage. A useful range of wood and corrugated iron buildings, including Stable, Chaff House, a 2-bay Shed and Store Shed, also some matured fruit trees. The fruit bushes belong to the tenant”. Surviving the demolition and property development in the 1960s wasn’t the end of the story for the remaining property by any means. In December 2015 the KHAS Secretary Geoff Whiteman emailed KHAS members to alert them to the fact that a planning application had been made to demolish the remaining cottage too: “Concerns have been raised about a current planning application in respect of 78-84 Warwick Road. Number 84 Warwick Road (previously numbered 86-90 – a possible source of confusion or ‘misunderstanding’) is a late 16th or early 17th century Grade II Listed Building, English Heritage ID 307855, and the planning application cites four Listed Building constraints that apply. 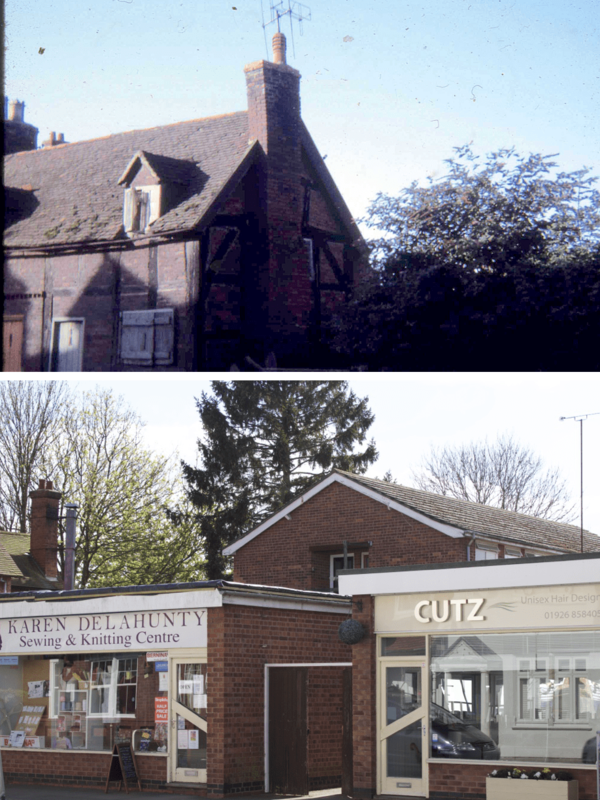 This building is listed in Steven Wallsgrove’s book ‘The Timber-Framed Buildings of Kenilworth’ and is one of only two such surviving structures on that stretch of Geoffrey de Clinton’s western side of Warwick Road, the other being The Bear and Ragged Staff. The building is currently occupied by Karen Delahunty, and over the years has had a variety of tenants, including plumbing and heating suppliers, antique dealers and pest control contractors. Long term residents in the town will fondly remember it best as ‘The Record Shop’, run by Mrs Diggins”. The email to KHAS members continued “Having looked at the plans, the Society is strongly inclined to make a formal objection to the current proposal, and to request that any proposed development should take particular care to preserve the structure, style, appearance and character of this unique building, which the current proposal appears not to do”. At the time of writing in 2017, number 84 Warwick Road has clung on and lives to fight another day, unlike its neighbours pictured above. *Note: The pre-decimal units of measurement a, r and p referred to here are acres, roods and perches.